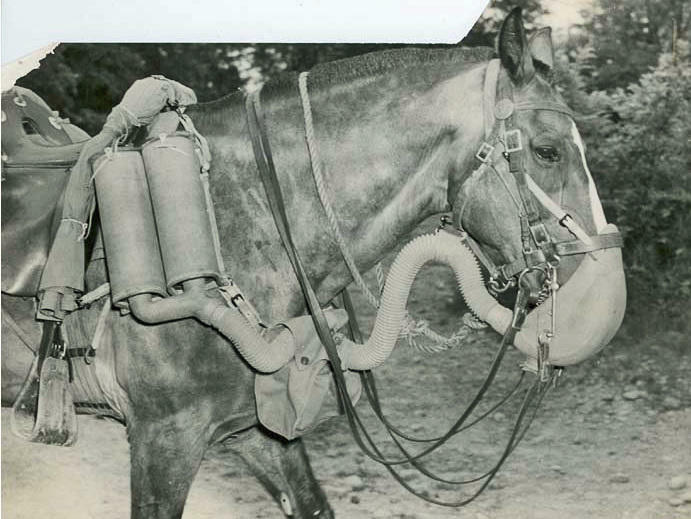 An Army horse wears a gas mask to guard against German gas attacks. 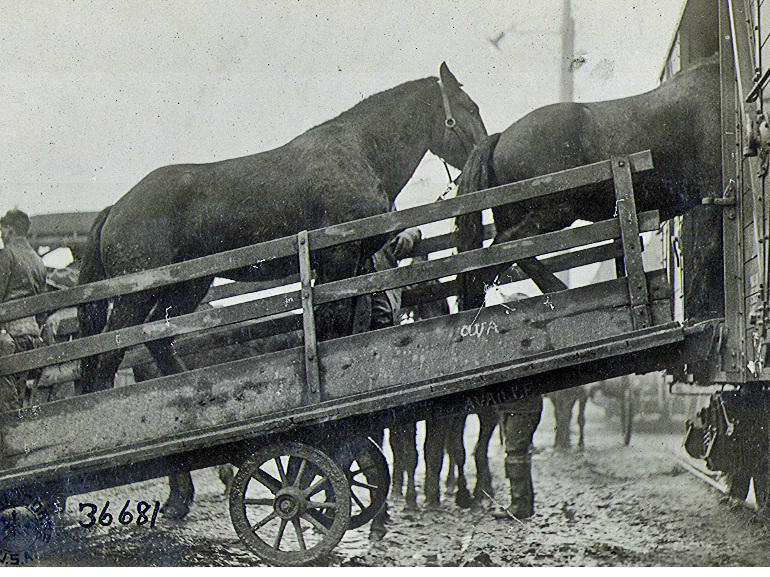 U.S. horses were loaded onto transport ships that went from the U.S. to European ports and later to the war front. April 6 marks 100 years since the U.S. Congress voted to declare war on Germany, entering World War I. The war took the lives of 17 million people worldwide. What's not as well-known is the role that animals played at a time when they were still critical to warfare. Horses, in particular, served alongside troops on both sides, and several million died during the war. The animals were so crucial to the war effort that they also became military targets. "You need these horses to move, to fight, to exist," says Christopher Kolakowski, director of the MacArthur Memorial in Norfolk, Va. "It would be like maintaining your car today." Hundreds of thousands of horses and mules were shipped to Europe from Newport News, Va., the largest departure point for horses and mules, during war years. The area around the port on the James River is now full of condos, office buildings, and even today — shipyards. Standing at the water's edge, Kolakowski says Newport News was ideally situated on the East Coast near rail lines and waterways. "You can get a sense here of the immensity of the harbor and why this is such a desirable port. ... You're not quite as crowded as New York. So it's a tremendous asset," he says. Animals were sold to the British and the other Allies in Europe even before the U.S. entered the war in 1917. Kolakowski says there was huge demand for horses and other supplies, and American businesses rushed to meet it. "The United States economy needs the money, needs the influx of dollars; there's a new market that has opened — and the United States economy adjusted to meet that. ... We're going where the business is," he says. At that time, animals were usually the best option for moving people and supplies, says Lynn Rainville, a research professor of humanities at Sweet Briar College. She's the author of a forthcoming book on Virginia's role in World War I, due out next year. "[They] were crucial for the very, very rough conditions of the roads and any transport routes that horses — or these four-legged animals — could maneuver better than the tanks and cars and trucks," Rainville says. Horses and mules were so valuable that Germans devised a plot to sicken some of them, as they waited in the pens at Newport News. The plot to spread anthrax, and a naturally occurring disease called glanders, was developed by Anton Dilger, an American-born German sympathizer who spent much of his youth studying science and medicine in Germany. "These diseases — anthrax and glanders — are so virulent that if he could infect them before they loaded onto the ships, that by the end of their journey most if not all of the mules would probably be dead," Rainville says. It was a surprising choice for the son of Hubert Dilger, a German immigrant and decorated Civil War hero, who earned a Medal of Honor for his service. "This guy's father does this incredible service in the American Civil War, and then his son chooses to support Germany in World War I," Kolakowski says. "It's a really interesting dichotomy in a family." Anton Dilger's plot was largely unsuccessful, says Robert Koenig, author of a book about Dilger, The Fourth Horseman: One Man's Mission to Wage the Great War in America. Koenig says the weak link may have been dockworkers who were paid to secretly infect the animals, but may not have followed through as instructed. This early attempt at germ warfare was only one of several ways the Germans targeted animals, including using a submarine to try to sink transport ships filled with horses, Koenig says. "They actually tried blowing up a train at one point that was carrying horses, and they went out to various stockyards in the Midwest, but that didn't prove terribly effective," he says. Had efforts to disrupt the supply of war horses succeeded on a large scale, Christopher Kolakowski says it would have been like disabling dozens of tanks, in today's terms. "That's the modern term of it — you basically slow or possibly grind operations to a halt and you definitely would have lengthened the war," Kolakowski says. Nefarious schemes aside, disease was still a constant threat to the horses living in close quarters. Bill Barker is an archivist at the Mariner's Museum in Newport News. He's been sorting through a trove of letters from a soldier named Joe Harlin to his parents in Liberty, Mo., while stationed at Newport News after the U.S. entered the war. A yellowed letter written on YMCA stationery, dated Aug. 15, 1918, is one of several that mention the animals. "Everything is just the same at the [veterinary] hospital, just as many sick horses as ever," the letter reads. Those animals that did survive their time at the stables and their journey across the ocean by ship often died of malnutrition, exhaustion or enemy fire, alongside the human soldiers who fought in World War I. "That's another piece that a lot of people forget about, is this was not just a war fought by ... men and women at the home front," Kolakowski says. "But it's also a war that was fought by animals." A hundred years ago today, the United States entered World War I. Congress voted to declare war on Germany. By the time it ended, there had been a staggering death toll - more than 17 million people worldwide. The soldiers who did return often had horrific injuries and emotional trauma. As this year's anniversary approached, NPR's Sarah McCammon went to Newport News, Va. She wanted to find out what happened to the vital support animals that were deployed from the region to serve alongside the troops. SARAH MCCAMMON, BYLINE: Today, the waterfront in Newport News is full of condos, office buildings and shipyards. One hundred years ago, this was a bustling seaport serving the allied war effort. CHRISTOPHER KOLAKOWSKI: You can get a sense here the immensity of the harbor and why this is such a desirable port. MCCAMMON: Christopher Kolakowski is director of the MacArthur Memorial. He says Newport News was ideally situated on the east coast near rail lines and waterways. KOLAKOWSKI: You're not quite as crowded as New York, so it's a tremendous asset. MCCAMMON: At least a quarter million troops embarked from here during the war years and so did several hundred thousand horses and mules. Animals were shipped to allies in Europe even before the U.S. entered the war. Lynn Rainville is a professor at Sweet Briar College. She says animals were usually the best option for moving people and supplies at a time when motorized vehicles were still in their infancy. LYNN RAINVILLE: Non-mechanized animal beasts of burden were crucial for the very, very rough conditions of the roads and any transport routes that horses - or these four-legged animals - could maneuver better than the then tanks and cars and trucks. MCCAMMON: Horses and mules were so valuable, Rainville says, that Germans devised a plot to sicken some of them as they waited in the pens at Newport News. The plot to spread anthrax and a naturally occurring disease called glanders was developed by Anton Dilger, an American of German descent and a German sympathizer. RAINVILLE: Anthrax and glanders are so virulent that if he could infect them before they loaded onto the ships that by the end of their journey, most if not all of the mules would probably be dead. MCCAMMON: Dilger's plot, which came to light after the war, was not successful, says Robert Koenig, author of a book about Dilger. He says the weak link may have been dockworkers who were paid to secretly infect the animals but may not have followed through as instructed. Koenig says this early attempt at germ warfare was just one of several ways the Germans targeted animals. ROBERT KOENIG: They actually tried blowing up a train at one point that was carrying horses. And they went out to various stockyards in the Midwest, but that didn't prove terribly effective. MCCAMMON: Still, disease was a constant threat to the horses living in close quarters. MCCAMMON: Bill Barker is an archivist at the Mariners' Museum in Newport News. He's been sorting through a trove of letters from a soldier stationed here during the war, Joe Harlin, to his parents in Missouri. Barker reads from a yellowed letter from 1918. BARKER: Everything is just the same as usual at the hospital - that's the veterinary hospital at the animal embarkation depot - just as many sick horses as ever. MCCAMMON: Those animals that did survive their time at the stables and their journey across the ocean often died of malnutrition, exhaustion or enemy fire, alongside the human soldiers who fought in the trenches of World War I. Sarah McCammon, NPR News, Newport News, Va.
(SOUNDBITE OF TEEN DAZE'S "BY LOVE") Transcript provided by NPR, Copyright NPR.